Three of the major groups of islands in the Pacific Ocean. ശാന്തസമുദ്രത്തിലെ ദ്വീപുകളെയാണ് പസഫിക് ദ്വീപുകൾ (Pacific islands) എന്നുവിളിക്കുന്നത്. മൂന്നുപ്രധാനപ്പെട്ട ഗ്രൂപ്പുകളാണ് ഇവയിൽ ഉള്ളത് പോളിനേഷ്യ, മൈക്രോനേഷ്യ, മെലനേഷ്യ. . In English, the umbrella term Pacific Islands may take on several meanings. Sometimes it refers to only those islands covered by the continent of Oceania. In some common uses, the term "Pacific Islands" refers to the islands of the Pacific Ocean once colonised by the British, French, Dutch, United States, and Japanese, such as the Pitcairn Islands, Taiwan, and Borneo. In other uses it may refer to islands with Austronesian linguistic heritage like Taiwan, Indonesia, Micronesia, Polynesia, Myanmar islands, which found their genesis in the Neolithic cultures of the island of Taiwan. Many islands located within the boundaries of the Pacific Ocean are not considered[by whom?] part of Oceania. These islands include the Galápagos Islands of Ecuador; the Aleutian Islands of Alaska, United States; Vancouver Island in Canada; the Russian islands of Sakhalin and Kuril Islands; the island nation of Taiwan and other islands of the Republic of China; the Philippines; islands in the South China Sea, which includes the disputed South China Sea Islands; most of the islands of Indonesia; and the island nation of Japan, which comprises the Japanese Archipelago. ↑ D'Arcy, Paul (March 2006). The People of the Sea: Environment, Identity, and History in Oceania. University Of Hawai'i Press. ISBN 978-0-8248-3297-1. മൂലതാളിൽ നിന്നും 2014-10-30-ന് ആർക്കൈവ് ചെയ്തത്. ശേഖരിച്ചത്: 14 December 2014. ↑ Compare: Blundell, David (January 2011). "Taiwan Austronesian Language Heritage Connecting Pacific Island Peoples: Diplomacy and Values" (PDF). International Journal of Asia-Pacific Studies. 7 (1): 75–91. ശേഖരിച്ചത്: 2 May 2015. Taiwan associations are based on almost forgotten old connections with far-reaching Pacific linguistic origins. 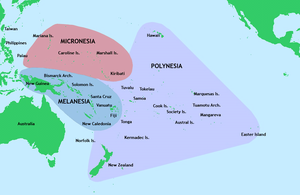 The present term Austronesia is based on linguistics and archaeology supporting the origins and existence of the Austronesian Language Family spread across the Pacific on modern Taiwan, Indonesia, East Timor, Malaysia, Philippines, Singapore, Brunei, Micronesia, Polynesia, the non-Papuan languages of Melanesia, the Cham areas of Vietnam, Cambodia, Hainan, Myanmar islands, and some Indian Ocean islands including Madagascar. Taiwan is in the initiating region. 1 Often included in Polynesia. 2 Often included in Southeast Asia. 3 Often included in Australasia. ഈ താൾ അവസാനം തിരുത്തപ്പെട്ടത്: 07:37, 3 ജനുവരി 2019.